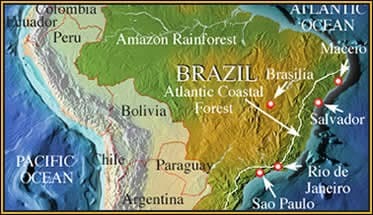 Location: The Atlantic coastal forests of Brazil is much smaller and more threatened than the vast Amazon rainforest. The Atlantic coastal forest of Brazil is less well known than the Amazon rainforest but it is much more threatened by deforestation and destruction, almost 90% of the forest has now disappeared and with it many species of flora and fauna. Emotive mammals and birds like the lion tamarin monkeys and Spix’s macaw are threatened with extinction, but so are many reptiles. The bushmasters are the largest venomous snakes in Latin America but they are amongst the most secretive and little known. These large pitvipers are also the only egg-laying vipers in the Americas. Two species occur in Costa Rica and Panama and a further species inhabits the Amazon and Orinoco Basins. A subspecies of the Amazonian species inhabits the endangered Atlantic coastal forests of Brazil. Since it can only survive in pristine humid tropical rainforest it is much more at risk from habitat destruction than the more ubiquitous lancehead pitvipers of the genus Bothrops. Mark teams up with Brazil’s two top bushmaster experts to try and find this rare and highly venomous serpent in what remains of it fragmented environment. Will they succeed in what seems an impossible task ? 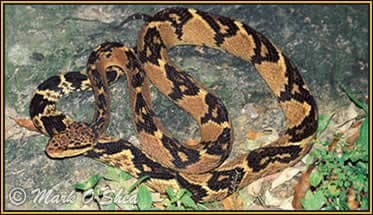 A close view of the Atlantic coastal bushmaster (Lachesis nuta rhombeata), the most endangered of the four bushmasters.